UW-IT’s most recent customer satisfaction survey was conducted May 2011. The survey of 2,100 randomly selected students, faculty and staff was conducted by MOR Associates, an external consultant with expertise in developing satisfaction surveys for IT organizations in higher education. 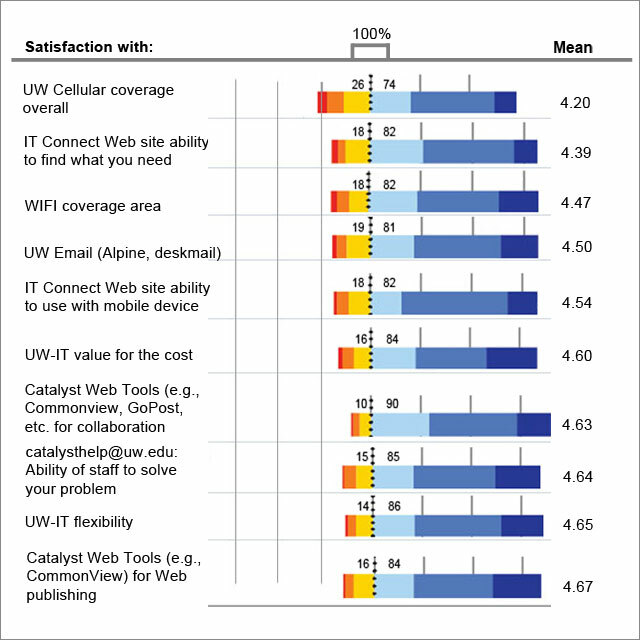 The full UW-IT 2011 Satisfaction Survey report is available. UW-IT plans to conduct its next Customer Satisfaction survey in spring 2015, and annually thereafter. 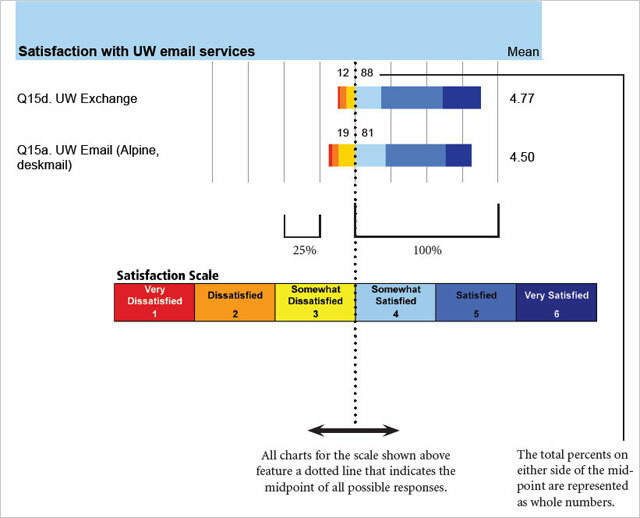 This table shows UW-IT customer satisfaction ratings by service area. * The data is from a May 2011 Customer Satisfaction Survey of 2,100 randomly selected students, faculty and staff conducted by MOR Associates, an external consultant. Rating was on a satisfaction scale of 1 to 6, with 6 being the highest. The response rate to the survey was high: 35 percent (745 responses). Scoring was on a satisfaction scale of 1 to 6, with 6 being the highest. UW-IT overall ratings: UW-IT’s overall quality of services was rated 4.88 (mean score), with 94 percent of all respondents at least somewhat satisfied. 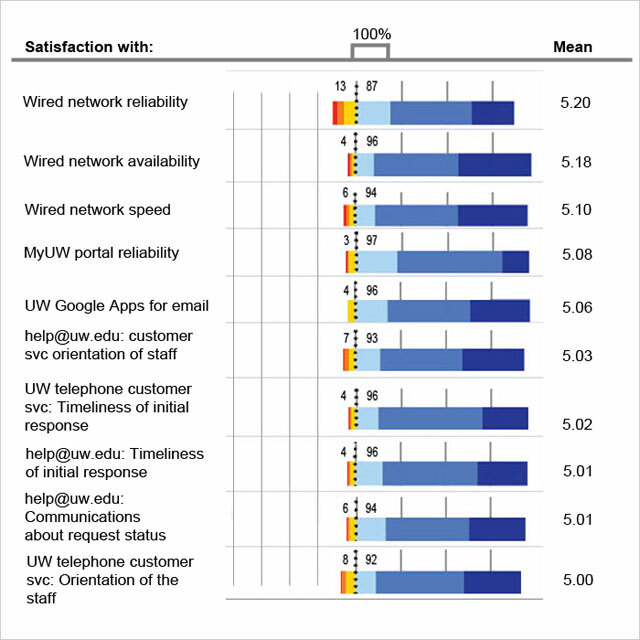 UW-IT’s responsiveness to customer needs was rated 4.86, with 91 percent of respondents at least somewhat satisfied. Areas rated highly: The reliability and availability of the wired network had the highest ratings for a major service, at 5.20 and 5.18, respectively. Also highly rated were UW-IT’s main help service (help@uw.edu), with scores in three key areas ranging from 5.01 – 5.03; and telephone customer service, with two services rated 5.00 and 5.02. Areas receiving lower scores: Lower-scoring areas included wireless network reliability rated at 4.69; UW email (Alpine deskmail) at 4.50; wireless network (Wi-Fi) coverage at 4.47; and cellular coverage at 4.20. The tables below show the services with the ten highest and ten lowest customer service ratings. The following example shows how to read the charts for the UW-IT services. The following table shows key UW-IT projects and other efforts underway, as of February 2013, to improve services in the lower-scoring areas.